Friday February 12th 1904 I had ironing and churning to do this morning. In the afternoon I picked out nuts for a cake. Mollie went to town tonight. I read in the evening. Saturday February 13th 1904 I did sweeping up stairs, baked bread and cake and got the dinner. Will went town in the afternoon and I went as far as home. Lorie is very poorly. a paper from Chillocothe tells of the death of Anna Goldsberry. I read all evening. Sunday February 14th 1904 weather colder again. I was at home all day. I read and wrote when not busy with the work. Mollie came about the middle of the afternoon. 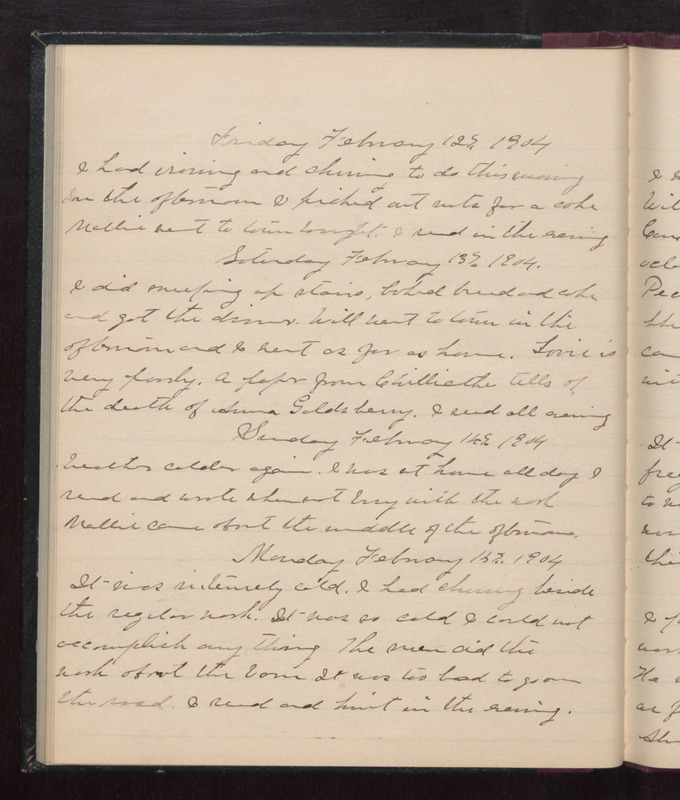 Monday February 15th 1904 It was intensely cold. I had churning besides the regular work. It was so cold I could not accomplish any thing. The men did the work about the barn. It was too bad to go on the road. I read and knit in the evening.